Walked through the downtown container park. It’s like a Gold Spike mall for families. 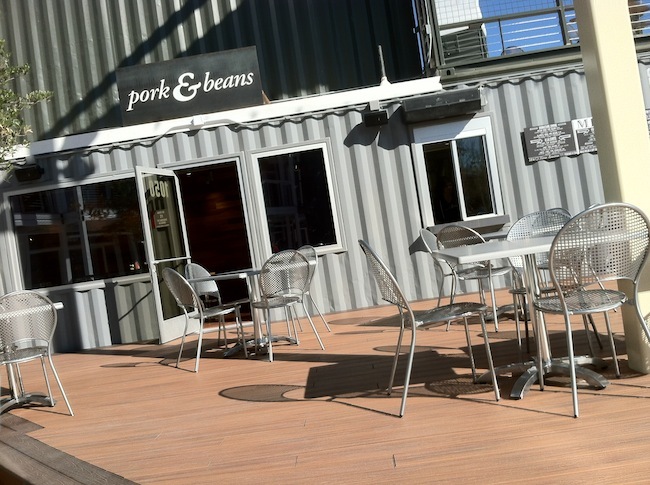 It’s rare that I agree with my first impression days after the fact but this is how I see the Downtown Container Park. 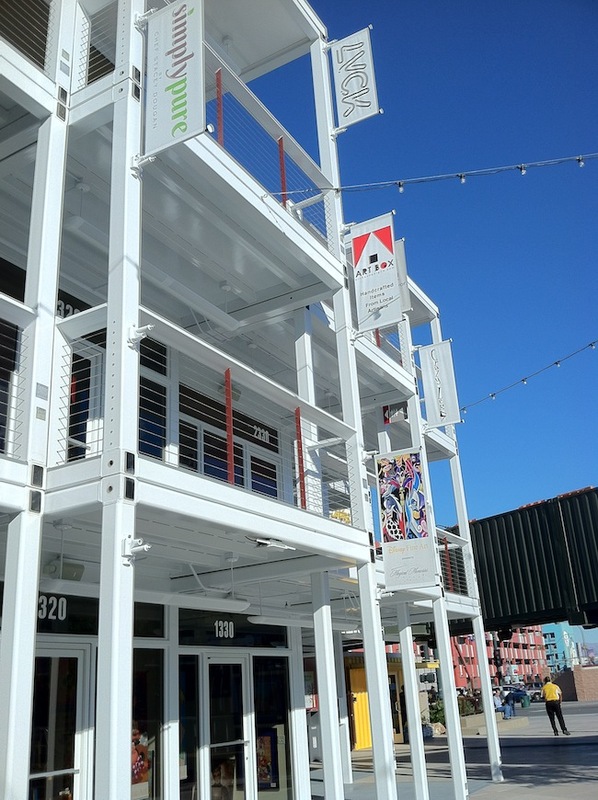 Downtown Container Park just opened in Downtown Vegas on Fremont Street a block past El Cortez. Downtown Container Park is essential an outdoor mall where the stores are all in storage containers. The mall surrounds a giant treehouse park area. The property has free wifi and a nice little grassy area with a stage for musicians to perform. I don’t love Downtown Container Park and I don’t hate it. It’s a mall. 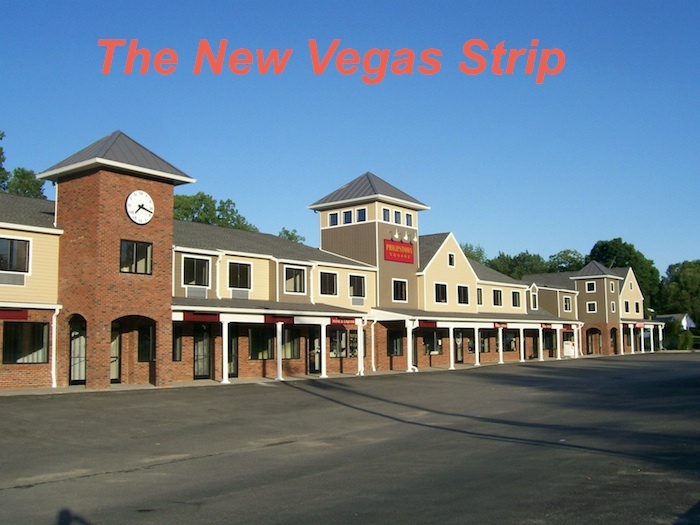 It’s not a traditional mall but it has all the contents that you’d find in a traditional mall. It’s a place for people to shop and eat or for parents to bring their kids to play during the day. At night the restaurants will cater to the anyone who would like to eat and drink outside. 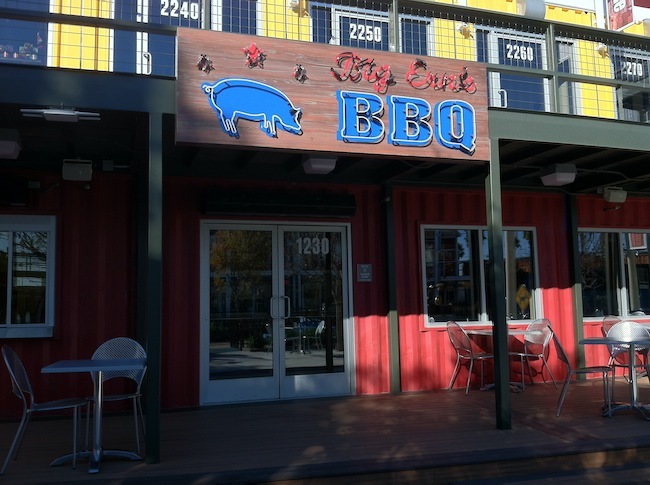 Let’s take a little tour and discuss specific parts of the Downtown Container Park. The containers are stacked 2 and 3 levels high. The containers aren’t very big which could make this a tight squeeze if it gets busy. The height makes for some pretty cool views if nothing else. Thankfully all of the food and drink are located on the ground level. The combination of metal tables, metal chairs and limited shade in the park seem like a horrible mix for summer in Las Vegas. Since the only seating for Downtown Container Park is outside this could pose a major problem. Maybe this is why they rushed to open an outdoor park/mall in time for winter. 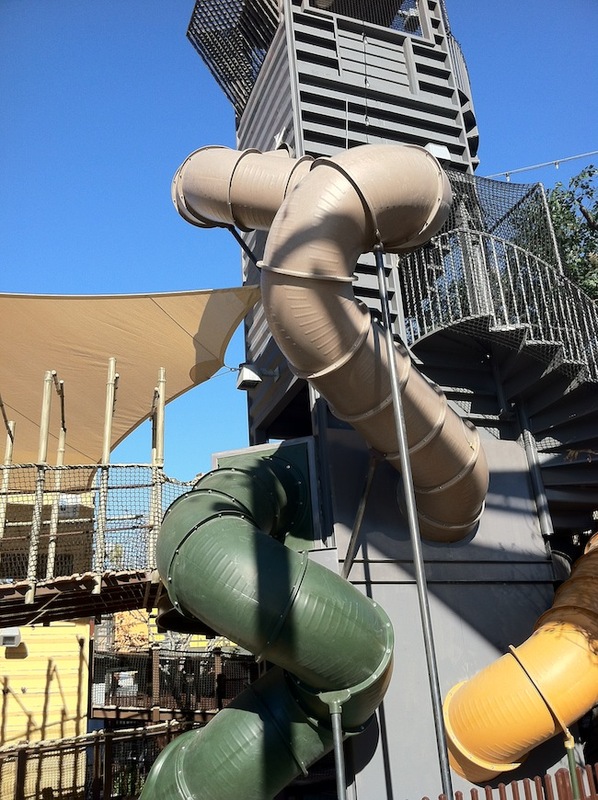 The treehouse slide and park is set in the center of all the containers at Downtown Container Park. This area looks like a really cool place for kids to play. It also offers some of the only shade in the Downtown Container Park. Kids 1 – Adults 0. 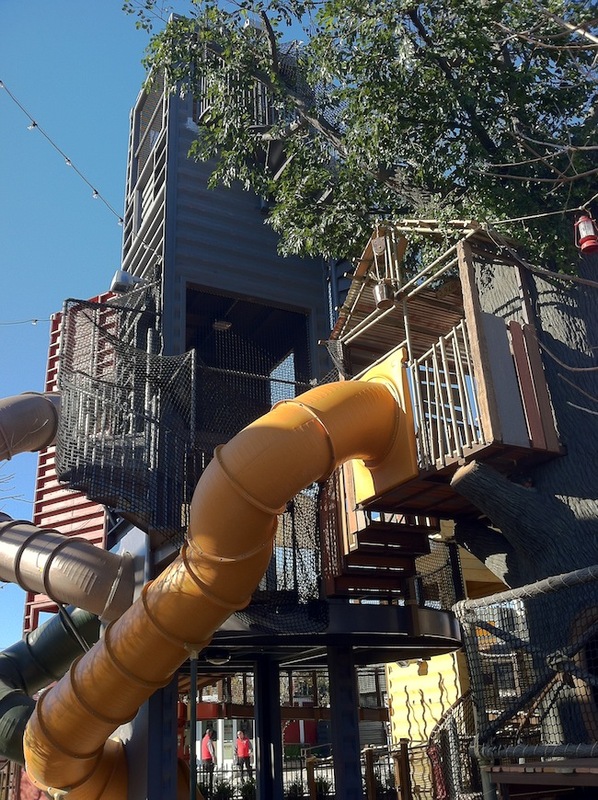 Another view of the treehouse slide at Downtown Container Park. Weeeeeeeeee! I can’t remember the last time I saw a water fountain that wasn’t from the 1920’s. 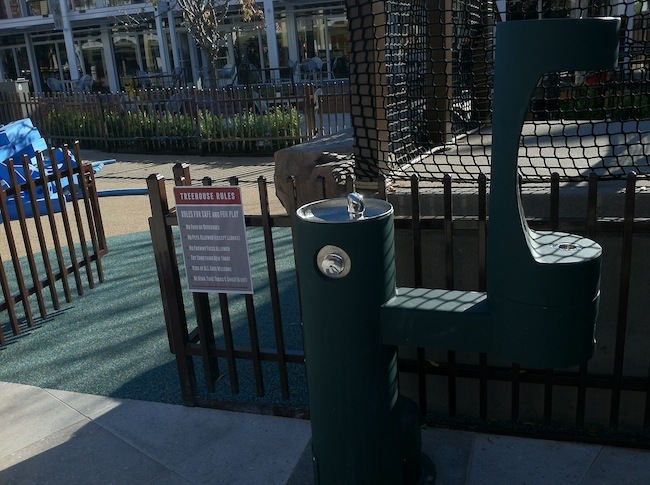 This is a nice addition to the park area although the metal may become a health hazard in the summer. 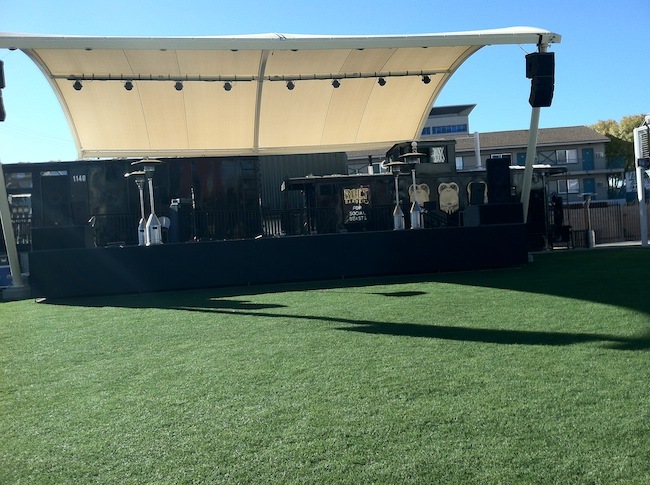 The stage area at Downtown Container Park looks pretty cool. It should fit legit bands at night and kids stuff during the day. This could be a great outlet for Downtown Project to preview bands for at no charge as a way to promote Life Is Beautiful Fest 2014. Note that the grass is real. That’s a big deal for the Vegas locals. 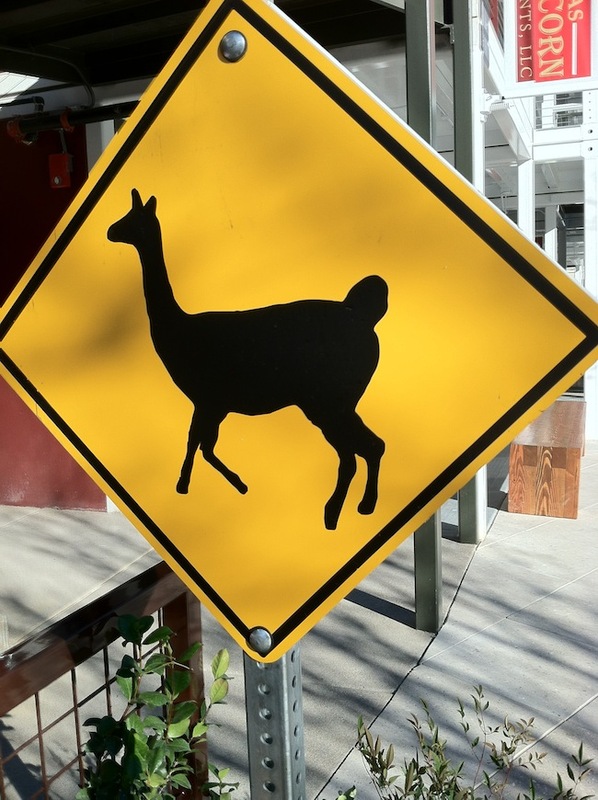 The Llama is the unofficial mascot of Downtown Project. If I was cynical I’d say that this was placed near the front of the Downtown Container Park to keep non-DTP people out. But that’s if I was a cynic and believed that DTP was really a cult. I mean, seriously. Downtown Container Park is a nifty little space that essentially takes up one city block. I think that Downtown Container Park could be a cool place to grab lunch and work a little (since they don’t open until 11am), bring the family for play time and shopping or to grab a few drinks at night while watching a band on the big stage. 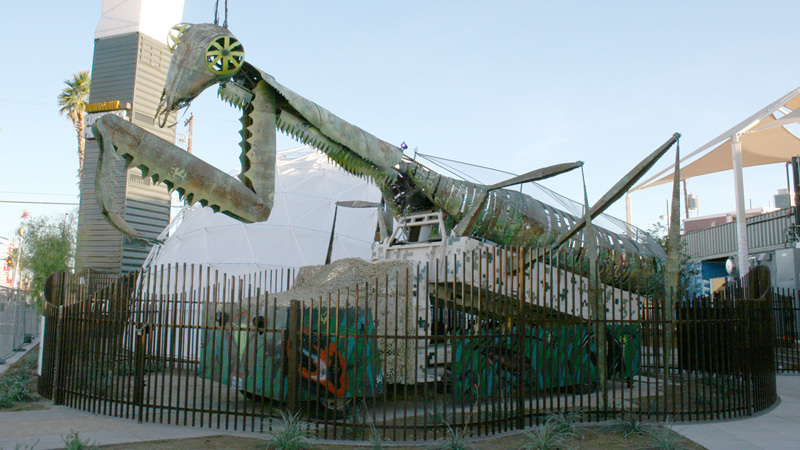 It’s another thing to check out when you’re visiting Downtown Vegas. Downtown Project has been doing a lot of development for a local community that they’re helping cultivate. It’s going to take some time to see if this works out as they intend. I’m not sure that I entirely understand the vision but that’s fine. I’ll enjoy the new life they’re breathing into Downtown Vegas. Will other people? Time will tell. 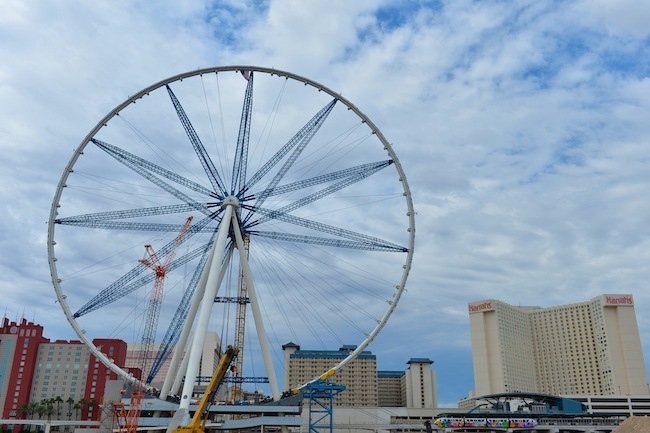 The Linq Gets A Circle! When The Linq was introduced a couple years ago I used to joke that it may not be real. Ground breaking was delayed a couple of times and little was happening. Well, The Linq exists. There is construction happening and some empty buildings waiting for some exciting tenants to move in, there’s a website and a huge circle (photo above) that will eventually become a ferris wheel. So they say. The Linq was rumored to be opening in the summer of 2013 but Caesars Entertainment never confirmed that. Then The Linq was supposed to open in December of 2013. Now The Linq will open in phases beginning in December 2013. A few stores will open in December. Some more will open in 2014 and the NAME TBD Ferris Wheel is said to open in the 2nd quarter of 2014. One day The Linq sounds like it can be a cool mall area to hang out and grab a drink and the next day there’s an announcement about a hat store and this sounds like the corniest place on earth. It’s enough to make a cynic go to a casino and drink soda! The giant ferris wheel is big and destined to become the new focal point of the Vegas Strip – for better or worse.